Health care spending is expected to accelerate over the coming eight years as the population ages and prices for medical services grow, according to the latest National Health Expenditure statistics released today by the Centers for Medicare and Medicaid Services (CMS). Spending will increase by 5.5 percent, on average, between 2018 and 2027, hitting $6 trillion in 2027. The projections, published in Health Affairs, estimate that health care’s share of the U.S. gross domestic product will reach 19.4 percent by 2027, up from 17.9 percent in 2017, assuming no regulatory intervention in the current health care system. 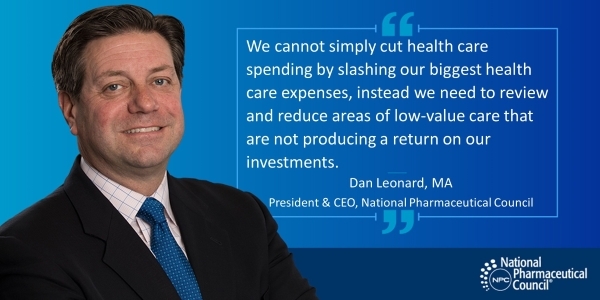 National Pharmaceutical Council (NPC) President and CEO Dan Leonard said that this accelerated growth in spending captures the need for targeted strategies to address low-value care in the current system. 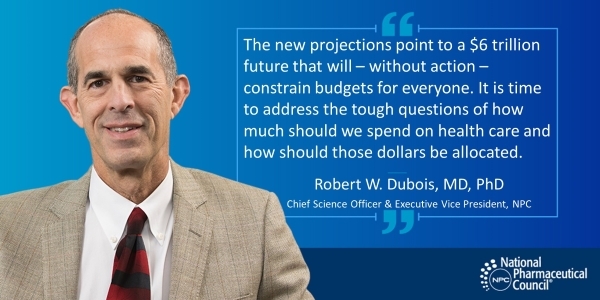 NPC Chief Science Officer Robert W. Dubois, MD, PhD, noted that enhanced focus from health care stakeholders, including policymakers, to reduce U.S. health spending is a start, but greater action is needed. NPC continues to be dedicated to addressing the root of health care spending through its Going Below the Surface initiative and ongoing “Considering Health Spending” series in Health Affairs.